A couple of reliable citizens tipped me off to rumors that the Ole Store is reopening. (I last blogged about it in April.) I took these photos last week. The brown paper on the windows is one telltale clue, but also the sign with the admonition from property owner Laverne ‘Professor Dr.’ Rippley. Will it be a full-service restaurant again or just a coffeehouse? And who is the proprietor? Update 2/9: the name is now either The Ole Cafe, or OleCafe, or Ole Cafe. I’ve edited the blog post title. Just this morning I noticed a big poster on the door of the Ole Store announcing that it’s opening in February. See the photo here: http://www.flickr.com/photos/northfield_mn/2101108892/. Thanks, Doug. So it appears as though it’s going to be called either The Ole Cafe or maybe just ‘OleCafe’ (domain parked, no website yet) to include: “cafe * bakery * pizza * wine bar”. A few months back I saw some food-service style shelving being moved into a back door at the Ole Store – thought to myself, “Ah, now THERE’S a good sign!” Perhaps my observation was a harbinger after all. A welcome return if it turns out to be true. It is reopening – in a form tailored after the Victoria Crossing’s Cafe Latte’ – to be run by a local entrepreneur- but is being assaulted by BO woes. 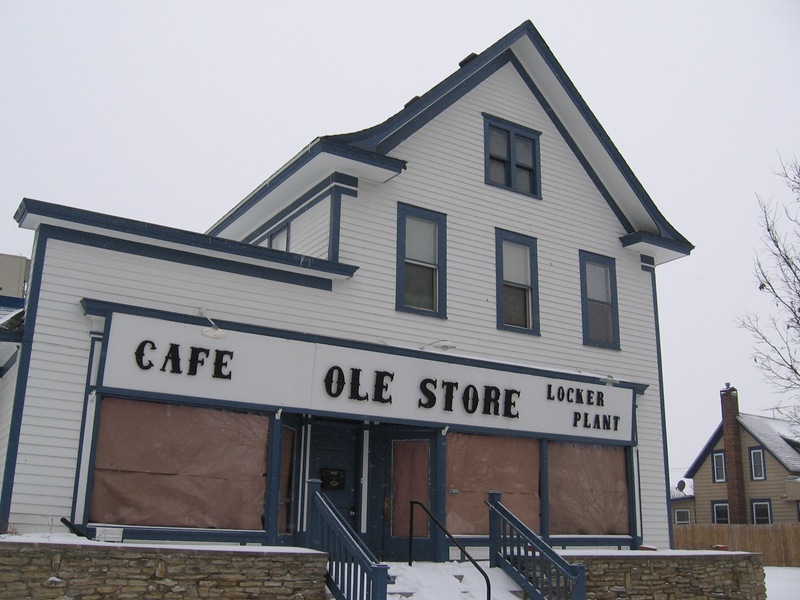 I guess an OleCafe is better than an empty building, but that new brand isn’t really winning me over. And pizza? Craziness. PS: I knew “Professor Dr. Rippley” had owned the property for a while now, but I guess the restauranteur’s identity is still under wraps! I agree with you we don’t need another pizza place. Does anyone like a good steak? I don’t understand why we can’t get a place to serve steak. I guess I’ll have to continue going to the cities. My problem wasn’t so much that it’s a pizza place as it is an Ole Store pizza place. I suppose its proximity to St. Olaf makes pizza a logical thing to serve. Just seems wrong, though. As a very close neighbor, I’m supportive of any effort to make the Ole Store live again. I guess my dreams of a Thai restaurant in that space will have to go back on hold, though…. Thai pizza, nothing’s wrong with that, Doug. I find it interesting that they are going after the pizza demographic. It must be the highend type, as I do not see students walking down the hill for pizza that can be delivered to the dorm. Also, St. Olaf has incredible food service, that is open to the public. The Stav Dining Hall, as well as a holiday “brunch” meal at the King’s Room is fantastic. It is one of Northfield’s best kept secrets. It really is amazing fine dining. I think students would go to the Ole Store more for atmosphere than anything else — good food or not, they need to leave campus from time to time. Two brief comments, Monte’s Steakhouse has updated their menu and website: http://www.montessteakhouse.com/index.html and I have also heard tell that the Ole Store will have some activity soon! Just noticed a banner for a new eatery at Mendota Homes corner building. I know this is the Ole Store blog but didn’t know where to ask the question? I saw it this morning on my way out of town as well. I will stop by on my way back, and find out what it says. The Final Course Cafe, opening January 2008. Sounds good to me. Hope they include the “Ole Rolls” from the original store. I also hope they serve them more often than just Sunday Morning. If the prices are reasonable, and they stay open ’til 1:00 am, it should be a good attraction for the Olaf students. There is a really good market segment just accross the street, so to speak. It will take more than just Olaf studnts to make it successful, though. I know they like to get off campus. My wife and I have been hosting a weekly informal dinner for a small group of them for several years. We have had students from Washington state to Maine be a part of that group. It keeps changing each year as seniors graduate and freshmen come along. It’s been really great for us, and I know the young people really enjoy it. The price is right, also. I don’t think the Stanglers (owners until 2005) ever passed the Ole Roll on — had they, I’m sure the Byhre Ole Store (2005-2007) would have served them. It’s a shame for the tradition, though I have to say I never really cared for Ole Rolls; I prefer the Brick Oven sweet rolls. The Final Course Cafe, at the Crossing, will be run (and owned?) by Dean and Rose Sorenmann. I know that Dean is an astute gourmand – some would say a foodie – so it’s likely to offer good fare. As a fairly close neighbor of the Ole Store, I’m glad to hear that it will reopen. There are so few retail establishments we can easily walk to here on the west side other than those at St. Olaf. And I second what John Thomas said about the food at St. Olaf’s dining hall – it’s really good! Where else could neighborhood cafes be opened? 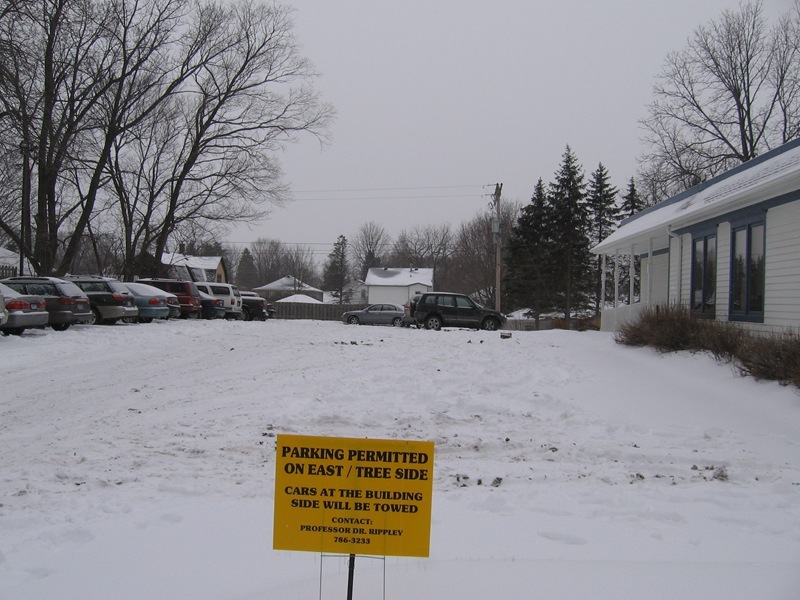 How about something over on the Northfield Retirement Center property? That would take some vision and daring on their part. A cafe could bring some community to some of our neighborhoods. Perhaps we should not focus on the pizza…maybe it will just be a great place that offers a lot of variety for everyone around town. I am very excited to see what the new place will offer. Anything is better than the last. Another great addition will be a cozy wine bar. I love to gather with girlfriends and have a great glass of wine and a delicious slice of cake. Good luck to the new owners…I know that I will visit often, or at least give it a chance. P.S. for your information, I have had great steaks at the northfield golf club and other wonderful meals…maybe try that instead of monte’s or porterhouse. The Ole Cafe’s website says they’ll be open in March. I spoke with Ole Cafe owner Angie Perez this morning. They’re hoping to open in early May now. The Ole Cafe is opening this week! I forget if it’s on Wednesday or Thursday, but there’s a sign on the door. The OleCafe opened today! I had coffee and a pastry there this morning. No reduced price for coffee refills, but hopefully this will change as their business improves. The setup is nice but seems somewhat sparse. College students will appreciate the cafeteria-style setup since there’s no worry about splitting the tab or waiting for everyone to arrive before ordering. And the ‘enter’ link ain’t lit. I will try it out next week and blog it. It’s my new hobby. Look for the blog in the sidebar soon, if I get approved. It’s gonna be all about Northfield restaurants. We visited the Ole Cafe last night. Quick review: it was ok but it could be much better. I would like to comment on the Ole Cafe. First of all, it’s delicious! I think it’s one of the best places to eat in Northfield. Everything is made daily and also from scratch. I have to say for my tastes, the cafe has the best soup in town. Chef Ashley makes the best pasta salads and soups ever! She can create a really original dish that is neat and new, but also classic favorites that taste wonderful! Owner Angie Perez and her mother Donna Pumper make all the pastries fresh daily and also from scratch. Angie has been teaching me the pastry making buis, she really is great at what she does. Im learning so much and am constantly amazed at what her and Donna put out there. Im a little suprised by your comments Bill. I can say that the pasta you had was maybe a little hard, but I can tell you that it was the last pan we had for the night. We know to ad more sauce for next time. I had the manicotti that same night only earlier and it was amazing. It didnt lack any flavor and was definetly more than “eh” as you put it. The cupcake that your party had, was actually meant for the kids. They like that frosting, hence the extra sweetness. We have a more gourmet cupcake that the adults really like. Not to mention all the other amazing desserts that I am so suprised you overlooked. Onto the panini, next time ask the girls to put less mustard on, and maybe some greek dressing. They are happy to modify for you! Let’s remember that we have just been open for a little over two weeks and the staff are still learning all the ropes. In the future, if you would like your cheese melted, just ask them to keep it on a little longer. I will say though that I wouldn’t order a panini with the ciabatta bread if you want it melted, it takes a long time for that to happen. There is a new roasted garlic bread for panini’s that is amazing! Try that one instead. The pizzas are made with fresh, gourmet toppings and are priced very fairly. I think that the quality and the taste is well worth the money. I hope everyone gives the cafe a fair shot. It is not the old Ole Store you are used to, be open to it. You won’t see the Ole Roll there, but you will see amazing cinnamon rolls, scones, brownie delights, white chocolate cheesecake, the list goes on and on. It’s important that you all know I am not saying any of these things because I work at the cafe, I truely believe them. The Ole Cafe, Tiny’s and The Quarterback Club are three restaurants in town that I will defend until I am blue in the face! They are all amazing and I feel “staples” for this town. While I’m at it, stop in to Tiny’s and try the new burrito my dad is offering. You won’t miss Chipotle when you try this burrito, his is DELICIOUS! Also, go to the QB and try Dales sausage egg and cheese breakfast sandwich, again, DELICIOUS. I love having breakfast at The QB, it’s mine and my husbands favorite! Ooh, and people don’t seem to realize that the Northfield Golf Course has a fantastic menu as well. You must go and try the steaks, they are just mouth watering. I had a hanger steak there last week and it was the best steak I’ve had in months. Go NGC! There are my thoughts on some of the dining in town. Trust me, I love food so believe me when I say those places are just wonderful! As someone who loves good food, loves to cook and has a dad in the restaurant business; my rule of thumb is to always give places three visits before I decide if I like them or not. Sometimes I dont’ order the right thing, or they could be having an off night, so I go back again and try again. Just a thought for some folks to keep in mind. I dont have really anything bad to say about any of the food places in town. I find things that I like at all of them and they all offer something different! Im done now, blah blah blah. Holla! Wow. Ally, you just might get nominated as Mrs. Taste of Northfield if you’re not careful. Thanks for that! I’ve had two lunches at the Ole Cafe, both excellent. The service has been great both times and I like the atmosphere. The meals were a bit less expensive than many others in town. So, put me in the camp that has found it to be a very nice place to eat. It does feel like there is some need to arrange the seating a bit better, but its not a major complaint. Those who expect to find the Ole Store as it was last time might be disappointed, but not because of the quality of this incarnation. Give it a try…expecting a cafe and some really great salads and desserts…you will likely come back for a second meal too!